Visual perception begins when light from our surroundings enters our eyes and passes through the transparent cornea and lens. The curvatures of the cornea and lens bend the rays of light, like the lens of a camera, and bring them into focus upon a thin, transparent layer of nerve tissue, called the retina, that lines the inner surface of the eye. The retina is actually part of the central nervous system. It is connected to the brain by a cable called the optic nerve that is made up of approximately one million nerve fibers. The retina contains a variety of specialized cell types called neurons, and supporting cells called glia, which are interconnected in various ways at contact points known as synapses and junctions. Six major cell classes, and more than 50 distinct neuronal cell configurations, have been identified in the retina to date. Photoreceptor cells make up the bulk of the neurons in the retina. Each retina contains approximately 105 million photoreceptor cells whose job it is to capture units of light energy called photons and to register those events as electrical signals in the "language" of the central nervous system. The electrical signals generated by the photoreceptors are then relayed to intermediary layers of neurons in the retina that process and organize this information before it is transmitted along the optic nerve fibers to the brain. Macular degeneration is a blinding disease caused by the death of the photoreceptor cells in that part of the retina known as the macula. 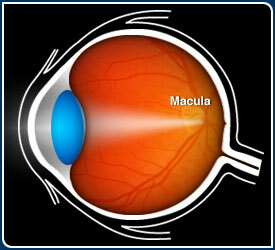 The macula is a circular area, approximately 3 mm or about 1/10 inch in diameter, that is located next to the optic nerve. In the age-related form of macular degeneration (ARMD), photoreceptor cells within the macula die off slowly, thus accounting for the progressive loss of vision that usually begins after the fifth or sixth decade of life. The two main classes of photoreceptors, rods and cones, are named from their cylindrical or conical shapes respectively. In general, the rod system functions primarily at low light levels (i.e. at night), whereas the cone system is designed to detect color and fine detail under daylight conditions. 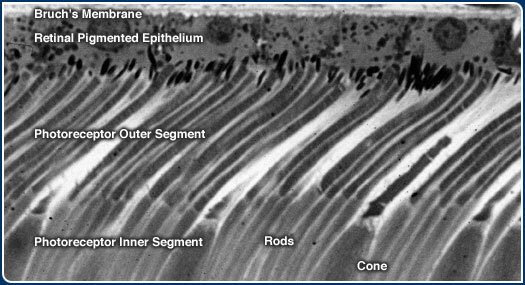 The majority of photoreceptor cells in the macula are cones, whereas most photoreceptors in outlying regions of the retina are rods. As one moves toward the center of the macula, the percentage of cones rises sharply, and reaches 100% in the center of a specialized region called the fovea. It is the degeneration of photoreceptor cells, primarily in the macula, that accounts for the loss of central vision and fine detail vision that defines ARMD. The precise reason(s) why the photoreceptors die in ARMD has puzzled vision researchers for many decades, and numerous theories have been advanced to account for this phenomenon. In addition to a general decline in the functional capacity of tissues and organs that is an intrinsic part of aging, genetic defects and environmental factors including nutritional deficiencies, excessive light exposure, and inadequate blood supply have all been invoked to explain their death. Thus far, however, there is no definitive and compelling evidence for any single theory. There is a scientific consensus that ARMD has a number of associated risk factors, one of which is a family history of the disease. This means that ARMD is similar to other diseases of aging, such as Alzheimer's disease and atherosclerosis, where a history of disease in one or more family members puts an individual at increased risk of developing it at some point in his/her lifetime. Furthermore, studies of identical and fraternal twins have shown convincingly that the development of ARMD in one sibling puts the other sibling at very high risk. These facts, together with the advent of modern molecular genetics, has triggered an intensive search for the gene(s) that may increase one's susceptibility to ARMD later in life. The study of families with a high incidence of other macular diseases that usually arise much earlier in life, well before the age of 50, has led to the identification of several genes that cause certain rare forms of inherited macular degeneration. Click Here for a comprehensive list of genes linked to retinal degenerative diseases. These diseases include pattern dystrophy, Best disease, Stargardt disease, Stargardt-like dominant macular dystrophy, Sorsby fundus dystrophy, and Malattia Leventinese (also known as Doyne's honeycomb retinal dystrophy). Although these other macula disorders are not the same as ARMD, the similarities are sufficient to warrant additional research to determine whether one or more of the same genes could also be involved. Recently, genetic linkage studies of individuals with and without ARMD have identified a candidate gene that could account for a small percentage of the more prevalent, age-related form of macular degeneration. This has led many to question whether ARMD is really a single entity or, like other retinal diseases such as Retinitis Pigmentosa, a family of related disorders with a genetic component that is characterized by a similar pattern of visual symptoms. The intensive search for ARMD-related genes continues and, with the completion of the Human Genome Project, should accelerate into the foreseeable future. It can be anticipated with some confidence that additional genes will be identified within the next few years that will be linked to the development of different forms of ARMD. The search for ARMD genes is augmented by research on the cell biology of this disease. The ultimate goal of this research is to identify the molecular mechanisms and cellular events that are responsible for photoreceptor cell death. This approach utilizes a variety of modern cell and molecular biological techniques, biochemical methods, and microscopic instrumentation. With the possible exception of some aged, non-human primates, animals do not develop ARMD. Therefore blood, ocular tissue specimens, and cells obtained from human donors provide the only available resource for such studies. What Cells and Tissues are Involved? Ophthalmologists have known for many years that abnormalities in the appearance of the retina can be used to diagnose and, in some cases, predict those who will go on to develop the more severe, vision-threatening forms of ARMD. Post-mortem examination of the eyes of individuals who show such changes using the light and electron microscopes have identified the anatomical location where those abnormalities occur. The affected region lies at the boundary between the photoreceptors cells of the retina and the choroid, a layer of connective tissue that contains the blood vessels which supply the photoreceptors. This region includes a single layer of pigmented cells, known as the retinal pigmented epithelium (RPE) that are anchored to a multilayered meshwork of fibrous proteins known as Bruch's membrane. The earliest recognizable signs of ARMD occur at the interface between Bruch's membrane and the RPE. The photoreceptor cells are among the most metabolically active cells in the body. As such, they are critically dependent upon a network of blood vessels, one in the retina and another in the choroid, for the delivery of oxygen and other essential nutrients, such as vitamin A, that circulate continuously in the blood. The RPE occupies a strategic location between the blood vessels in the choroid and the photoreceptors. Thus, these cells are in a unique position to mediate the transport and clearance of blood borne nutrients and other metabolites to, and from, the photoreceptors. Several decades ago, it was discovered that the RPE cells are responsible for the removal and digestion of molecular components that are shed from one end of both rod and cone photoreceptor cells on a daily basis. This portion of the photoreceptor is known as the outer segment and it consists of a stack of membranes, similar to a roll of coins. The outer segment houses the molecular machinery responsible for capturing photons of light that impinge upon the retina. The outer segment membranes contain a light-absorbing protein called opsin which is tethered to a molecule of vitamin A. When photons strike the opsin-vitamin A complex, it undergos a change in shape which, in turn, triggers a cascade of biochemical reactions all of which occur in a small fraction of a second. This fundamental process, called visual transduction, initiates the biochemical reactions that ultimately lead to the perception of a visual image. The biochemical cascade leads to the generation of an electrical signal that is transmitted to the opposite end of the photoreceptor cell, and from there to neurons in the inner retina for processing , before it is relayed to processing centers in the brain via the optic nerve. 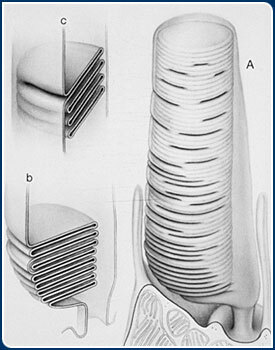 Photoreceptor outer segment membranes are manufactured continuously at the base of the stack and, periodically, shed from their tips. In a process known as phagocytosis, small packets of the shed membranes are then enveloped by tentacles of the RPE cells, and incorporated into the cells' interior where they are digested by enzymes. This mechanism of photoreceptor outer segment membrane turnover is also an indispensable part of the process required for normal vision. (Quick Time Movie of how photoreceptor outer segment renewal works). In the absence of a viable and healthy RPE, the shed photoreceptor membranes cannot be removed and digested promptly, membranous debris builds up, and the photoreceptor cells' supply of vitamin A and other nutrients becomes depleted. If such conditions persist, the photoreceptors die. What is the Primary Defect in ARMD? Because the photoreceptors are critically dependent upon the RPE cells for their own survival, it is not clear whether the primary defect(s) in ARMD lies in the photoreceptor cells, in the RPE cells or, perhaps, in some combination of both. It is known, however, that genetic alterations (i.e. mutations) in rod photoreceptor-specific genes, including the rod opsin gene, are responsible for a separate family of blinding disorders characterized primarily by the loss of rods and peripheral vision. By analogy, mutations in one or more cone opsin genes are obvious candidates as ARMD genes, although there is no published evidence of their involvement thus far. At least one other photoreceptor-related gene, ABCA4, is under investigation as a candidate ARMD gene at the present time. Mutations in the ABCA4 gene cause Stargardt's disease, a rare inherited form of macular degeneration that occurs in one person out of every 10,000. Many vision researchers believe that the visual deficits that account for a significant proportion of ARMD are not caused by photoreceptor gene alternations. According to this theory, photoreceptor cell death is a secondary consequence of a primary defect in the RPE cells, which could be attributable to any number of genetic and/or environmental factors. As such, it is appropriate that the study of the RPE in both health and disease has been, and continues to be, the object of intensive research. By the age of 60 in most individuals, prominent changes take place in the RPE cells, and along Bruch's membrane, the platform on which they are anchored. The cells become increasingly laden with pigment granules called lipofuscin that contain concentrated by-products of cellular metabolism which are potentially toxic, highly resistant to further degradation, and therefore difficult to eliminate. Bruch's membrane, which is rich in fibrous proteins such as collagen and elastin, thickens significantly and several types of deposits start to accumulate, each of which is associated with a specific layer of Bruch's membrane. 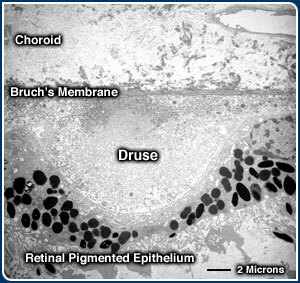 The most prominent of these deposits are called drusen: small, balloon-like expansions of the innermost layer of Bruch's membrane that displace the overlying RPE and photoreceptors cells. When an ophthalmoscope is used to visualize the macula at rear of the eye, drusen appear as small yellow spots that range in size from 30 to over 100 micrometers in diameter, or between 1/1000 to 4/1000 of an inch. Electron microscopic examination of tissue sections (see below) reveals many more drusen within and outside of the macula that are up to 10 times smaller. Drusen are regarded by many ophthalmologists as the hallmark clinical sign of early ARMD. The appearance of numerous drusen and/or large drusen, especially in the macular region, is a significant risk factor for the subsequent development of the most prevalent type of ARMD, the atrophic or "dry" form, that accounts for approximately 85% of clinically diagnosed ARMD. Identifying the origin and molecular composition of these drusen deposits, therefore, has remained an important but elusive objective for many decades.